The Starr Piano Company produced the budget Champion Label from 1925 to Dec. 1934 and would often feature a release of a Gennett artist under a different name to avoid paying royalties. In 1927, the Champion label appeared with the word “Electrograph.” Champion records may be blue, black or red. 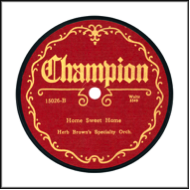 The Champion label was sold to Decca in June 1935. Decca would remove the word “Electrograph” and add the phrase “Electrically Recorded.” Decca discontinued the Champion label in April 1936. Record Label: 1927-1936. Note the word “Electrograph” beneath Champion label. -Rust, Brian. The American Record Label Book. Arlington House Publishers, NY. 1978. -Sutton, Nauck. American Record Labels and Companies: An Encyclopedia (1891-1943). Mainspring Press, CO.2000.